I grew up In Davison behind the Davison fire hall in rosemore park on wisler st. Are street is was were the horse stables sat. My grandfather found a old horseshoe while building a new shed and I also found a old lipstick case. But the subdivision is exactly one mile around and from what I was told is that their was a fire that started in the stables and quickly overwhelmed everything. I'm going to look for that old horseshoe! I beleav my father has it somewhere and I will post a pic. 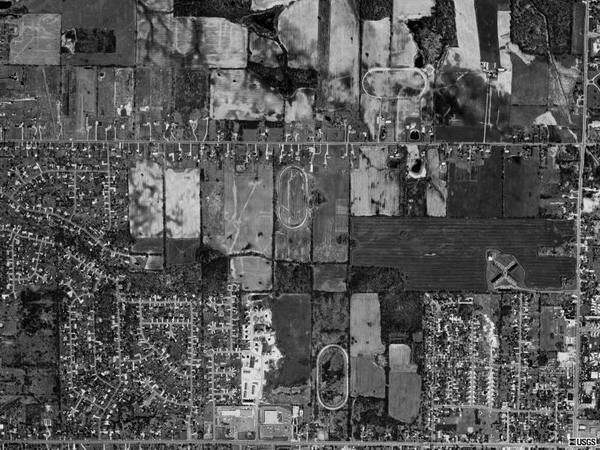 The info I have on this track calls for it to be at the old Genesee County Fairgrounds which later became th Rosemore housing development. My best guess would be just east of Main St. between E Clark and E Rising Sts. There is a Rosemore Drive in that neighborhood. Maybe a local can go pull the aerial at the USDA Soil Service office and verify. My father attended a midget race at the Davison track as a child. Probably middle 1930''s I would guess. He told me that the track was on the east side of M-15 about 3/4 mile north of what is now I-69. The site is now a large shopping plaza. He remembered a very long delay in the racing while an injured driver was transported to a hospital in Flint. That was probably Dad''s first exposure to auto racing. He was a life long fan of midget and sprint car racing. He passed in 2003. Nice website. I live in Davison and was looking at pics of some old race tracks. I am not 100 % sure but these pics look familiar to the birds eye view you get when flying over. I think believe it or not these tracks that appear in the photo are private horse tracks at some area farms. A few of them are right down the street from my house. i will try to check on the location for the Davison track and get back the info back to you.